Missoula is a great place to live for many reasons – the natural beauty and wealth of available activities are two aspects that have brought consistent population growth to the area. Since 2000, Missoula County’s population has grown by over 20,000 people, currently making Missoula the second largest city in the state. But that growth has brought some challenges. For instance, a higher population means increased traffic congestion, which results in an endless need for ongoing road improvement projects. More people in the city means larger crowds looking to get away and explore Missoula’s open space recreational areas. But the biggest issue with growth is housing affordability. An increase in population tends to put upward pressure on the price of housing. The reasons are fairly straightforward – if an increase in population is not combined with an increase in available housing units, then the result is more people trying to outbid each other for the same places to live. And if local housing prices increase faster than local household incomes, then housing affordability decreases. This is what’s currently happening with Missoula’s housing market. 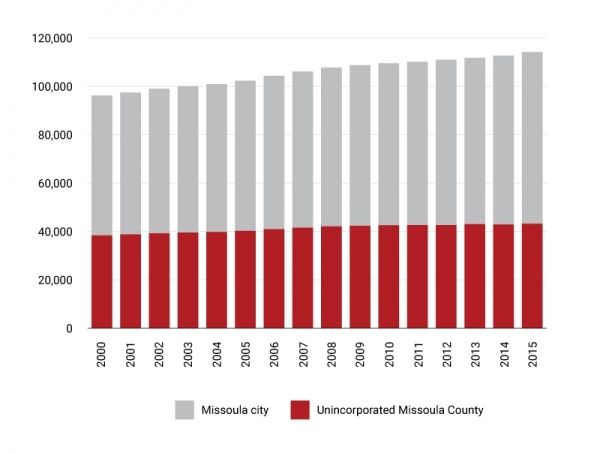 Figure 1 gives us information about the population dynamics in Missoula County since 2000. We see that the majority of the growth to Missoula County has occurred in the city of Missoula itself. That growth and a lack of increased housing has put pressure on housing prices. Figure 1. Population, Missoula County, 2000-2015. Source: U.S. Census Bureau and University of Montana, Bureau of Business and Economic Research. In Figure 2, we can see the housing price index increasing to pre-recession highs, making it clear that the cost of housing is largely tied to the increase in the population. But how does this affect housing affordability for the residents of Missoula? Figure 2. 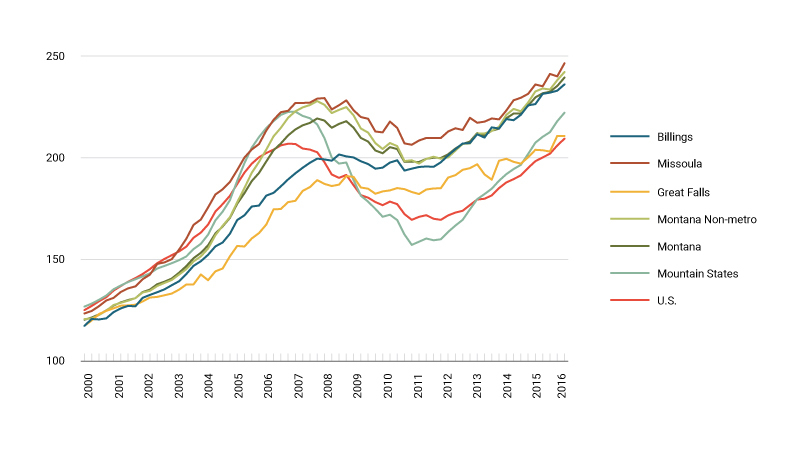 Housing price index, 2000Q1-2016Q3. Source: Federal Housing Finance Agency. As mentioned before, if growth in housing prices outpaces growth in household incomes, then housing affordability decreases. It is estimated that between 2012 and 2015, the median household income in Missoula remained flat or experienced a slight decrease. As of 2015, the estimated median household income was $42,815. So essentially, Missoula has an increasing population, increasing housing costs, flat or decreasing household incomes, and thus, decreasing housing affordability. One way to think about housing affordability is to estimate the level of household income required to purchase a median priced home. In 2016, the average priced home in Missoula was $255,000, meaning the household income required to purchase a home was around $89,000. The first thing that stands out about this number is that in order to purchase a home, a household is required to earn roughly double the median household income in the area. Another notable aspect of this measurement is that the median household income among homeowners in Missoula is currently $63,000. This would indicate that if a current homeowner were on the market to move to a new home, they wouldn’t be able to afford one. This is a telling measurement for how housing affordability has changed over the last few years. With home ownership becoming less of an option for median income families, more households are entering the rental market. Between 2010 and 2015, owner-occupied housing units in the city increased by 3 percent, while the number of renter-occupied units increased by 8 percent. Currently, renter-occupied units make up roughly 52 percent of all occupied housing in the city. The bright side for renters is that rental prices, while higher than the state average, have remained fairly stable since 2013. The average price for rentals in the state is $711, while the average in Missoula is $769. If we were to break that down a bit further, an average priced, one-bedroom apartment in a multiplex in Missoula costs around $625 a month, while a two-bedroom home averages a little over $1,100 a month. An interesting aspect about renting in Missoula is that rental vacancy rates have continued to drop. In 2015, only about 4 percent of all rental units in the city were vacant, which is a fairly low rate of vacancy. In 2016, this number fell even further to 2.9 percent. However, in the face of this declining rental availability, prices have stayed relatively stable over the last three years. The last measurement of housing affordability is to look at housing costs as a percentage of income. If housing costs exceed 30 percent of household income, then a household is more likely to be financially burdened by the expense. This means that the household will have more difficulty meeting all of their financial needs and be less prepared for unexpected expenses. A large proportion of Missoula households, both renters and owners, are financially burdened by the costs of housing. Somewhere between 11 to 31 percent of homeowners in Missoula spend more than 35 percent of their income on housing. This figure is even greater for renters in the region – between 28 and 55 percent of renters spend more than 35 percent of their annual income on housing. These estimates taken together would suggest that more residents in Missoula fall under this cost-burdened category, which is concerning. So we see that Missoula, with all of its attractions and beauty, is having some growing pains when it comes to housing affordability. A growing population, rising home prices, a large proportion of households being cost-burdened with respect to housing, and the growing disparity between the median home price and the median household income, indicate that housing affordability is likely to remain a concern and a challenge for its residents. Brandon Bridge is an economist and director of forecasting at the Bureau of Business and Economic Research at the University of Montana. The Bureau of Business and Economic Research has been providing information about Montana's state and local economies for nearly 70 years.